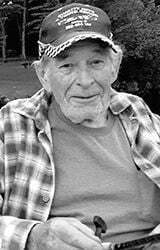 THREE LAKES- Lloyd C. Bellaire, 90, passed away at Froedtert South on Friday, April 12, 2019 with his family by his side. Lloyd was born in Racine on July 17, 1928 to Clarence and Verna (nee: Zade) Bellaire. He married Eunice Krueger. She preceded him in death. Lloyd was employed at Styberg Engineering until his retirement. Following his retirement Lloyd and Eunice moved to Three Lakes. Together they enjoyed attending craft fairs, gardening, and occasionally going to the casino. Lloyd loved living on the lake. He enjoyed spending time wood working, fishing, hunting and feeding the deer in his backyard. Most importantly he was a loving husband, father and grand-father. He will be deeply missed. Lloyd is survived by his children, Deborah (Ralph) Luker and Jamison Bellaire; grandchildren Stacy and Joshua (Gina Griffin) Bellaire, Rachael, Heather, and Christopher Bellaire and Kaylee (Ryan Balchitis) Bellaire and Kyle (Katelyn) Bellaire; great grandchildren, sister Mary Ellen (Marshall) Chovan and daughters in law JoLynn and Amy Bellaire. He is furthered survived by nieces, nephews, other relatives and friends. Lloyd was preceded in death by his sons Michael and Lloyd and sister Dolores (Lee) Hanson. A memorial service for Lloyd will be held at the funeral home on Monday, April 22, 2019 at 11:30 a.m. Private inurnment will take place. Relatives and friends may meet with the family at the funeral home on Monday from 10:00 a.m. until the time of services.